I'm seeing a lot of sweatshirts on Instagram which means Fall is here in some parts of the country, but not here in Texas! I'll take another month of heat for a nice, temperate Winter, though. 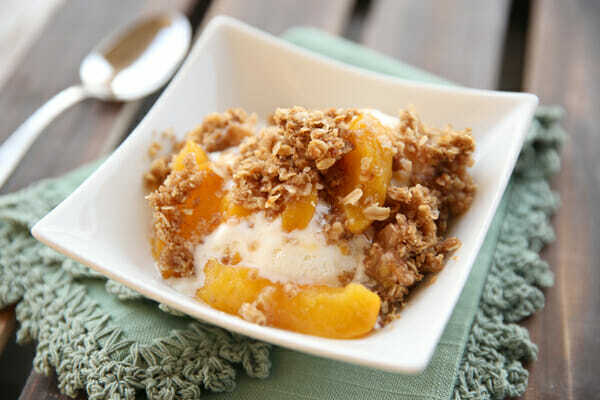 I was feeling Fall-ish the other day, though, and decided to make a fresh peach crisp because we invited some friends over for dessert. It was seriously SOOOO delicious. Everyone loved and it and it was gobbled right up in a hurry. I served mine up with a scoop of Blue Bell Vanilla Bean ice cream. There is a great tutorial on how to get the skins off of peaches on Our Best Bites. If you're going to make this, definitely take a look at it to save time and energy. Mmmmm! 3 1/2 lbs ripe but firm peaches (6-8), peeled, pitted, and sliced into 3/4″ wedges. For topping, combine oats, brown sugar, flour, nutmeg, and cinnamon and either grate the cold butter with a large-hole cheese grater, or cut it into small cubes and use your fingers to crumble the mixture together. Sprinkle topping evenly over pan. Bake for about 30 minutes. The topping should look golden brown and crisp, and I always watch for little bubbles of peach liquid to start popping though the outside corners. Let cool to luke warm before serving. Spoon over ice cream.